The design of the LG L227WT is quite basic, but the screen is finished in an attractive glossy black colour. The screen itself features a standard anti-reflective coating, rather than any glossy finish. The bezel and base are reflective (making photogrphy difficult!) but the screen looks nice in both home and office environments. The bezel is pretty thin and the stand is reasonably sturdy. The materials are of a good standard and apart from the screen being a little wobbly, build quality is very good as you would expect from LG. Above: Side and rear view. The stand clips into place easily enough as it is disconnected in the package to help save room. The base does offer a pivot function to allow the screen to be rotated easily enough, but lacks any height or rotation adjustment. I think it's always useful to feature a height adjustable stand, since not everyone will want the screen positioned at the same height. The tilt adjustment is quite restricted, but at least it is there I suppose. The mechanism is quite stiff as well, and there is only a small range in which the screen can be moved, as shown above. The screen offers two interface options, with a D-sub (VGA) and DVI-D being present. The DVI interface is HDCP certified according to LG's specs. The monitor offers an internal power supply and so you just need a standard kettle lead type cable to connect to the mains. No need for external power bricks here thankfully. The back of the stand also features a handy cable tie which clicks in place to hide the cables nicely. The OSD buttons are situated beneath the front bezel and are easy enough to press. They are nicely tucked out of the way. The power button glows an attractive blue colour, as shown in the image above, when the power is on, and goes orange in standby. I'm not sure why LG felt the need to have this button protrude below the line of the bezel, but it doesn't distract too much from the aesthetics. The OSD itself is pretty standard, but the controls are not as intuitive as other screens we have tested I felt. They aren't obviously labelled and so it takes a little time to navigate. There are the usual options for brightness, contrast and RGB channels as you would expect. There is also a preset gamma mode and colour temperature modes, including sRGB and temperatures from 6500k to 9300k. The OSD control buttons give quick access to the EZ-Zooming feature, f-Engine preset modes, source (VGA vs. DVI) and 'Auto' config for analogue signals. The f-Engine preset modes available are 'Normal', 'Movie', 'Text' and 'User', each offer varied brightness, contrast and colour settings. Some modes also enable the screens dynamic contrast ratio (LG's Digital Fine Contrast - DFC). The EZ-Zooming feature allows you to quickly switch between screen resolution modes to immitate zooming in on text and images. Not really something many will find useful I shouldn't think, and more of a gimmick than anything. The LG L227WT utilises a 6-bit panel with FRC technology being used to boost the colour palette to a reported 16.7 million colours. The screen uses enhanced W-CCFL backlighting and so it's colour gamut covers 100% of the NTSC colour space according to LG's specification. An important thing to consider for most users is how a screen will perform out of the box and with some basic manual adjustments. Since most users won't have access to hardware colorimeter tools, it is important to understand how the screen is going to perform in terms of colour accuracy for the average user. I restored my graphics card to default settings and set it to its standard profile. The L227WT was tested at default factory settings out of the box using the LaCie Blue Eye Pro and their accompanying software suite. Default settings of the screen were 100 brightness and 70 contrast. Gamma mode was left at 0, colour temperature preset mode was set to 6500k and RGB levels were all left at 50. The f-Engine mode was left on 'normal'. At default settings the screen was far too bright. The manufacturer had left the OSD selection for brightness at 100 and this made the screen pretty much unusable really without leading to eye strain. Testing with our colorimeter revealed that luminance was a very high 334 cd/m2, far above the recommended 120 cd/m2 for an LCD screen in normal lighting conditions, and even higher than the specified 300 cd/m2. This was the first main problem immediately evident when you turned the screen on. Secondly, you could tell that the colours were way out at the default settings, looking very cartoony and fake, and with an emphasis on looking vivid rather than accurate. So clearly our observation was correct, the colour accuracy was very poor out of the box overall. 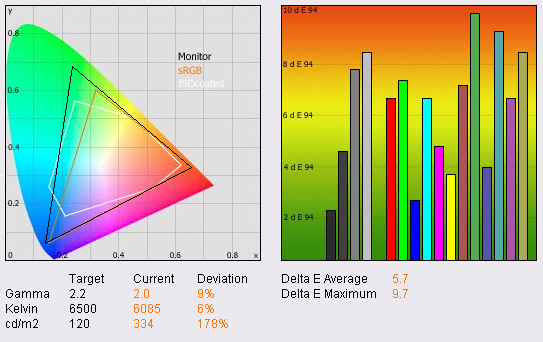 Aside from that the colour is also measured in the CIE diagram on the left hand side, where the black triangle represents the monitors colour space (its gamut), and stretches considerably beyond the standard triangle for the sRGB standard colour space. LG list the screen as having a gamut which covers 100% of the NTSC colour space, and clearly outside that which standard backlighting can offer, only really covering the sRGB space and equating to 72% NTSC. Gamma was recorded as being a little out at a reading of 2.0, not quite at the 2.2 which is the default for computer monitors, and the standard for the Windows operating system and the Internet-standard sRGB colour space. Colour temperature was actually reasonably good since the monitor was left on the 6500k preset mode, which is our target temperature of daylight. The probe recorded actual colour temperature as being 6085k, but only 6% out from the desired value at least. Black depth at the default luminance was a pretty average 0.43 cd/m2, offering a static contrast ratio of 777:1 which is pretty respectable for a TN Film panel. While the monitor certainly offers a nice wide colour space, factory settings were poor and calibration would be needed in order to get any real accuracy out of the screen, or indeed make it useable in normal conditions. I calibrated the screen with the LaCie colorimeter and software and the results were far more pleasing. Luminance was perhaps the main problem with the screen at default settings, and it was now corrected to a far more comfortable 121 cd/m2, certainly more usable in practice as well. It should be noted that it was a little hard to adjust the OSD brightness control to achieve a suitable luminance reading since the software process had trouble identifying a reasonable level before LUT alterations were made. During the calibration process the OSD selections were adjusted to 45 brightness and 50 contrast, so use those as a starting point if you can. At this new adjusted luminance, the black point was recorded at an impressive 0.21 cd/m2. This was not quite as good as the Iiyama E2202WSV we tested recently, which is another 22" TN Film based screen (0.16), but was a bit better than the Acer AL2216W we tested last May (0.23), and the ViewSonic VX2245WM from last April (0.26). All in all, a pretty decent black point for a TN Film panel, and the 576:1 static contrast ratio was decent enough after calibration. During the calibration process the RGB channels were adjusted in the OSD to 50, 32 and 45 respectively. This made a fairly obvious difference to the colours straight away, even before the automated calibration stages took place. This would be a god starting block to help improve things from factory settings at least. The calibration then continued, and the final results were very good. 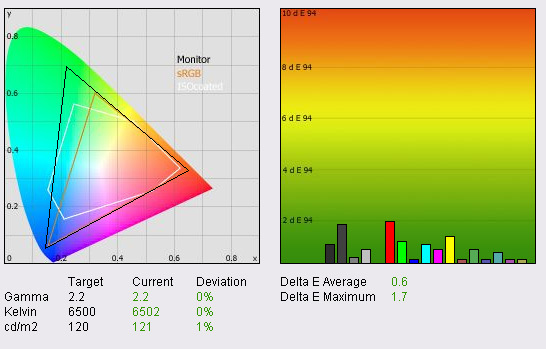 dE was now 0.6 on average, with the screen offering excellent colour fidelity according to LaCie's classification. dE max was 1.7, so only a slightly difference between the requested and displayed colours which was in the red tones. Colour temperature was now pretty much spot on at 6502k and gamma was corrected nicely to 2.2 as well. Testing the screen with a colour gradient program revealed an interesting feature. It was easy enough to spot some gradation in the darker tones which you may see on quite a few screens. However, what was also noticeable was that LG have used some spatial dithering mechanisms it seems to produce the 16.7m colour palette. Some 'chess board' like checkered patterns were visible if you looked closely, but only in the darker tones. It should be noted that in practice you are unlikely to see this issue day to day. Viewing angles of the L227WT were unmistakably TN Film! The screen showed the characteristic and obvious blackening when viewed from below, as you can see from the above images. As you moved your head vertically a white background would pick up a slight pink tint when viewed from below, and a slight green tint from above. This became a little distracting in office use since a white Word background would look uneven as you glanced across the screen. At 22" in size, the screen is big enough for this to be reasonably obvious, but I think it becomes more of an issue when you start using 24" or bigger sized screens, and remain with TN Film panel technology. Horizontally the viewing angles weren't too bad, but the contrast shifted noticeably from about 40° away from a central point and the image became 'warmer'. If you are buying this screen you will hopefully realise that it is TN Film based and know what to expect, but sadly the viewing angles don't offer you much room to change your line of sight. A height adjustable stand may also have been handy here to help set the screen at a sensible central field of view, sadly it is lacking. As you can see, the L227WT showed some variance of about 15% both below and above the 120 cd/m2 luminance value. The panel uniformity was average in this test, and the diagram shows that the left side of the screen was a little darker than the right. In practice, you couldn't really spot any issues with this. Viewing the screen with an all black background showed no noticeable issues in terms of backlight leakage, either from the corners or the edges, which can commonly be a problem with LCD screens. The uniformity in this test appeared to be good. I've said it before, and I'll say it again, a 1680 x 1050 resolution is nice for side by side office working, but not quite enough to be really great. I think a 1920 horizontal resolution is a nice step up, so consider whether you may benefit more from a 24" screen perhaps, even if it is TN Film based. The 'text' f-Engine preset was actually brighter than my calibrated 'normal' profile, and so pretty useless in my situation. If you prefer a brighter default profile for gaming and movies (which is what the screen is aimed at I suppose), then maybe the 'text' preset will be useful. I would have preferred it to be a bit darker than it was. 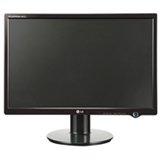 The screen offers both analogue (D-sub) and digital (DVI-D) interface options. Switching between the two showed that the VGA connection was actually of a very good standard, and it was very hard to spot any real difference in picture quality or sharpness between that and the DVI interface. The 0.282mm pixel pitch makes this screen nice and comfortable for office use for prolonged periods of time, and especially for those who prefer text size which is a little easier on the eye. As I mentioned above in the viewing angles section, when viewing a white background you can notice some unfortunate colour tinting as you glance away from a central point of view. This is an issue related to the viewing angles of the TN Film panel used, and is characterised by a pink hue from below a central point, and a slight green hue from above. Not something which will bother everyone, but a little more obvious than some other TN Film panels we have tested. 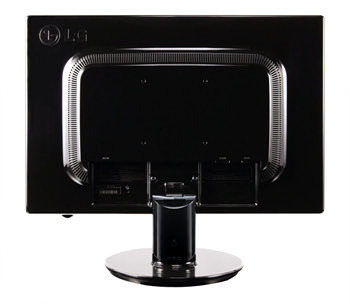 Interestingly the other LG model we tested last year showed a similar viewing angle shift (LG L1960TQ). 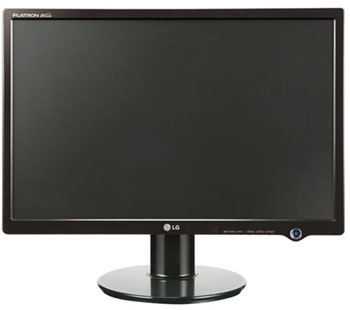 The LG L227WT was tested using the chase test in PixPerAn, a good bit of software for trying to quantify differences in real terms responsiveness between monitors. As a reminder, a series of pictures are taken on the highest shutter speed and compared. The images below show the best case example on the left hand side, and the worst case example on the right hand side. This should only be used as a rough guide to comparative responsiveness but is handy as a way of keeping a constant test of each screen. The LG L227WT uses Response Time Compensation (RTC) technology to boost the response time across grey transitions, with the aim to improve responsiveness of the panel as a whole. This 'overdrive' technology has been applied to a traditional 5ms rated TN Film panel and boosts some G2G transitions to as low as 2ms (in LG's measurements). The improvement in practice is obvious when compared using a common testing method. The Acer AL2216W and Iiyama E2202WSV screens above are both 5ms rated, and feature no overdrive / RTC technology. Even the best case example in the images shows an obvious second ghost image of the moving car. When watching the screen you can see this with the naked eye as well, and the movement of the car is not as smooth. 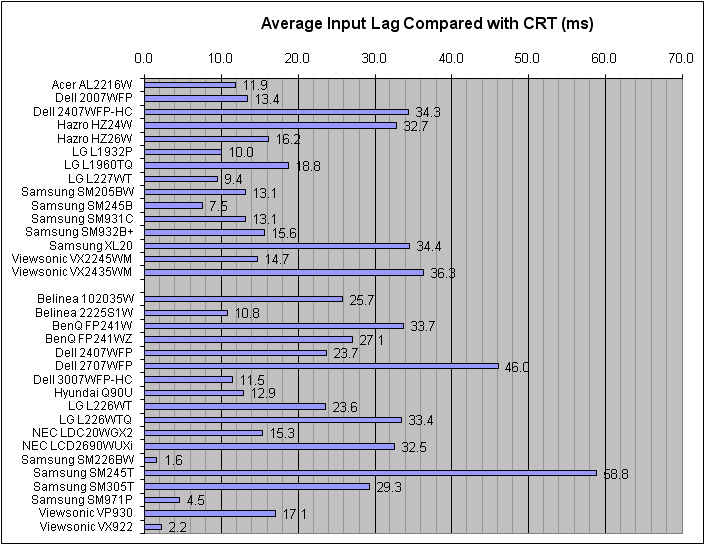 The LG L227WT is very similar fundamentally, except that RTC is being applied to boost G2G transitions. This is important in pratice, not just on paper, and the above images give an indication of the improvements made. The car moves much more smoothly, and it is not possible to detect a second ghost image with the naked eye. You can see some slight pale halo-ing behind the moving car, which is related to some 'overshoot' of the RTC impulse. It is not obvious to spot, but our camera picks this up and you will see a slight pale patch behind the car. Regardless, it is clear to see that the application of RTC here has really helped improve the responsiveness of the panel compared with those models that do not feature such technology. For comparison, I have also included the tests above for the Samsung SM931C which also uses a 2ms G2G rated TN Film panel and shows very similar performance to the LG L227WT. The NEC 20WGX2 has long been considered one of the most responsive panels in the market and is actually AS-IPS technology based. The LG.Philips panel used in the NEC also uses a heavy dose of RTC to boost the responsivenss of the panel, and so this model can still be used as a reference for our response time tests. To summarise, the LG L227WT performs very admirably in these tests and clearly the 2ms G2G rated TN Film panel used is well suited to gaming and fast multimedia content. Since the screen is marketed in this way, this is an important result and LG should be pleased that the screen can offer what it sets out to do. Another thing to note is that the screen does feature hardware level aspect ratio control to a degree. This is nice to see, and good to see LG have even listed this feature in their specification on the website. This is a positive up-front approach which consumers should be glad to see. This aspect ratio control offers an option for '4:3' aspect sources (games, external devices etc.) without the screen always stretching the image horizontally. 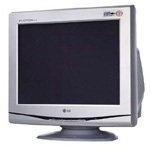 As you can tell from the above, the LG L227WT was on average 9.4 ms behind the CRT screen. It should be noted that in some instances the stop watch showed 0ms difference, but on some occasions ranged up to 20ms. Overall, this was an admirable performance from the L227WT and the input lag was minimal. The screen size of 22" is decent enough for movie watching, and the widescreen format is certainly preferrable to a standard aspect ratio screen. The 1680 x 1050 resolution is not quite enough to offer a full true 1080 HD support, and you would need a resolution of at least 1920 x 1080 to offer this. The viewing angles of the screen are characteristically TN Film, and so not really ideal for viewing movies. Vertically the viewing angles are a challenge, and positioning the screen to a suitable level is not easy when you're trying to watch from a distance away. Perhaps a height adjustment would have helped here as well, but the panel technology is not really ideal for this application. Vertically you will notice contrast shifts which make it difficult to pick out detail in darker scenes. Panel uniformity is good, and so there is no obvious leakage from the corners or edges of the panel. This can be particularly distracting when watching movies with black borders at the top and bottom, and so thankfully the L227WT is free of this issue. Colours look vivid and bright which is attractive for movie viewing. Black depth is also good once calibrated, helping to ensure detail is distinguishable in darker scenes. The 'movie' preset mode might be handy to some, along with the dynamic contrast ratio. This can help bring out detail in darker scenes, and make lighter scenes brighter. Many people find this technology annoying however, so it's down to personal preference. The hardware based aspect ratio control can be useful for viewing external sources which are not in WS format. The screen isn't really the best in terms of interface options. Perhaps an additional component or HDMI interface would have been useful for connecting external DVD players or games consoles. Movie noise is evident, being a heavily overdriven TN Film panel. As usual, if you sit away from the screen a metre or two, you won't really notice this. LG have tried to incorporate all the top-end specs in this 22" model and have done quite a good job. The fast response time make this well suited to gaming certainly, and our tests reveal it is very good in this regard. LG also market the screen at movie viewing which the screen can manage to a degree. Ultimately the screen remains TN Film based, and users will probably know what to expect. Viewing angles are restrictive and limit the screens use in many applications including movie viewing. Colour accuracy is poor at default settings, but if you are able to calibrate the screen properly, you can actually get quite a lot out of this screen in this regard, especially when you consider the extended colour gamut offered. All in all, this is a good screen for gamers out there, and for those who don't mind the sacrifices of TN Film technology. It offers a few extra features over some other 22" models in the market at the moment (such as the DCR and extended gamut) and so it can at least offer that little something extra if you want.